Steel construction completely coated in Silicone which is Heat resistant up to 400XF (204XC), BPA-Free, Dishwasher Safe. Sure Lock Extenders, NSF listed, 19-3/4Wx19-3/4Dx4H. 5 lbs. 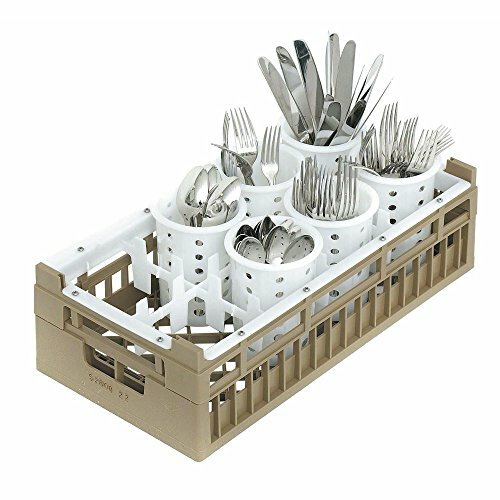 The Carlisle RTP14 OptiClean Tall Peg Plate / Tray Rack makes washing, storing and transporting larger items such as charger plates, platters, trays easy. 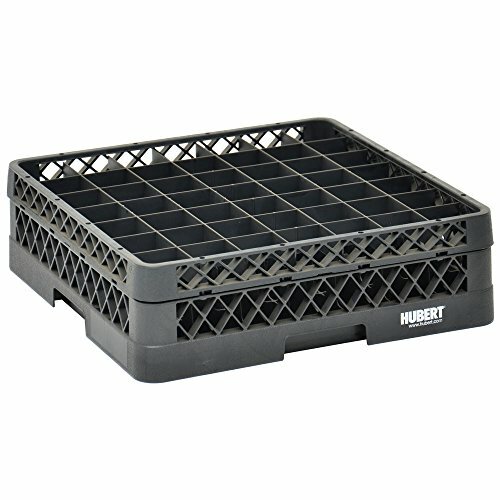 Plates are secured by an 8 x 8 grid of 2.96" tall pegs designed to items securely in place reducing chipping and breakage. 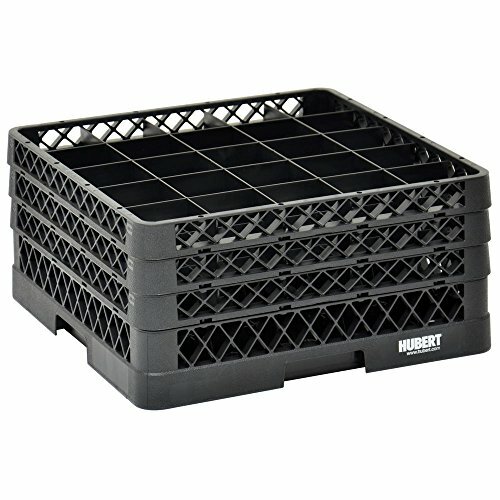 Made from durable polypropylene plastic, the OptiClean RTP14 ware washing rack is safe for use in commercial dishwashers and will standup to harsh detergents and heat up to 200 degrees F. The pegs hold items at an angle taking full advantage of the multiple spray arms of modern commercial dishwashers. The distance between the pegs is 1.75". The RTP14 is certified by the National Sanitation Foundation, made in the USA and recyclable. Warranty: Carlisle warrants to the original buyer that if this product proves defective (manufacturer's defect) within one year from the date of purchase, Carlisle will replace the product free of charge. This warranty only covers manufacturer's defects and does not cover abuse, misuse, normal wear and tear or modifications to the product not made by Carlisle. 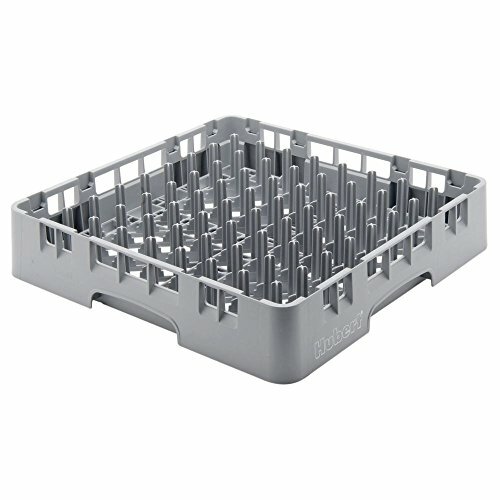 Wash, store and safely transport silverware using the Cambro 8FBNH434151 1/2 Size 8-Compartment Flatware Rack. Features an open design that promotes thorough washing and complete drainage. The smooth top rim of each rack ensures smooth and safe stacking. Made of durable, long lasting polypropylene, withstanding chemicals and temperatures up to 200F (93.3C). Stackable, fits through any commercial dishwasher. NSF. This product measures at 7-3/4 inches long by 18 inches wide with an inside rack height of 4-3/4 inches and outside rack height of 7-1/4 inches. High Quality - Well made with sturdy, high quality plastic, which is stylish and durable. Design - Convenient-to-use design, this dishwasher rack has an open bottom allowing for quick drying. 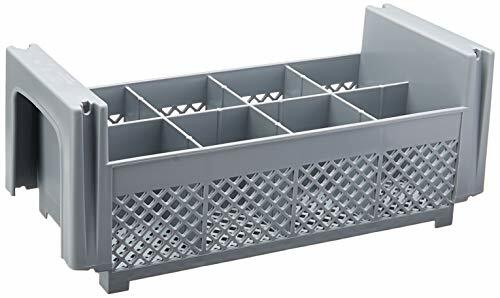 Size -This peg rack organizer measures around 12.8*5.8*2.7(H)inch, 32 stands with large capacity to meet your requirement and prevent plate breakage. Occasions - Perfect for plates, bottles, mugs and more, it could maximize kitchen storage space in cabinets and tables and keep all things tidy and organized. Customer Service - With Casagood, we promise 100% no risk buy or exchange, please contact us and we will do our best to give you the most satisfactory solution. This dishwashing rack is made from 100% post industrial plastic for an eco friendly product. This item has an open profile to promote a thorough washing and air circulation. 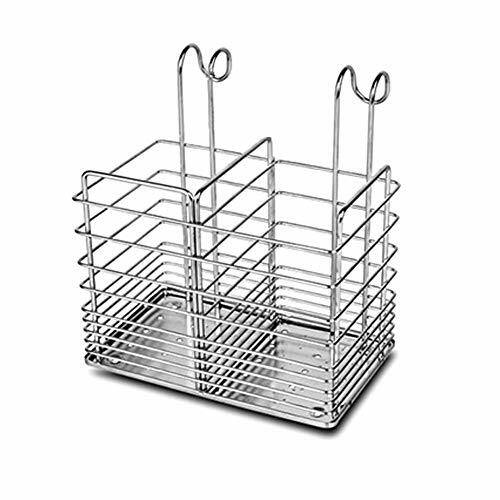 This dishwashing rack is designed for flatware as it has a mesh surface to keep flatware and similar items in the rack. Product is chemical, impact and heat resistant, safe up to 180 degrees F for 30 minutes. 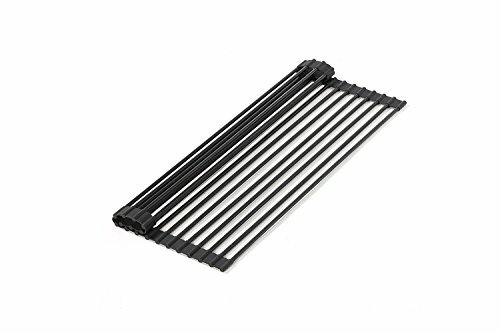 This dishwashing rack is a black coloration that may vary slightly. The Carlisle RF14 OptiClean Flatware Rack provides and efficient and sanitary way to wash, store and transport large quantities of flatware. The open design is also ideal for ramekins, bowls and other small items. Made from durable polypropylene plastic, the RF14 flatware rack is safe for use in commercial dishwashers and will stand up to the harsh detergents and heat up to 200 degrees F. The open sides and bottom allow maximum water and airflow for through cleaning. The RF14 measures 19.75 x 19.75 and will fit in any standard sized commercial dishwasher. It is certified by the National Sanitation Foundation, made in the USA and recyclable. This dishwashing rack extender allows for additional height on the existing product. This item extends your item by 1 3/4". 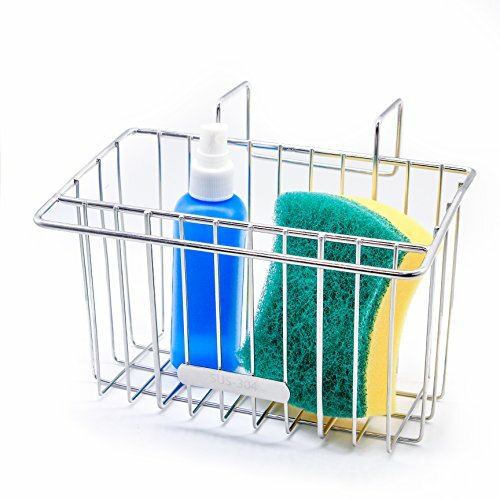 This dishwashing rack is made from post industrial plastic for an eco friendly product. This item has a snap fit feature to attach to your existing rack that will not loosen over time or come apart. 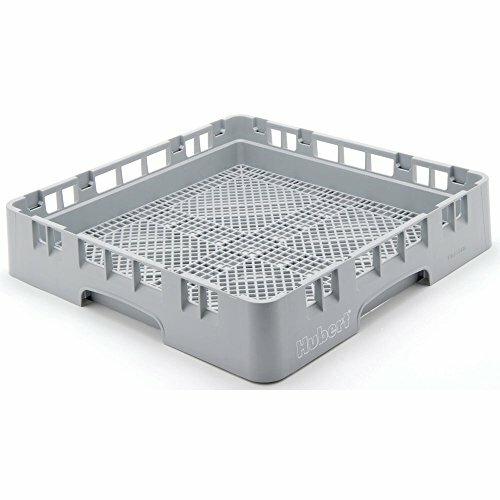 This dishwashing rack extender is purchased separately and added to existing product. 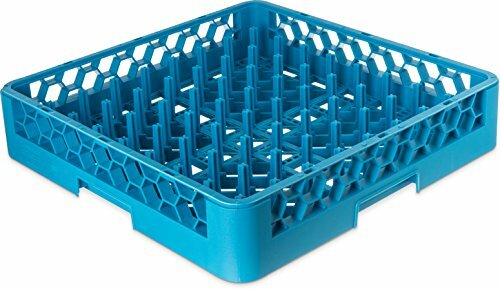 This dishwashing rack is eco friendly as it is made from post industrial plastic. 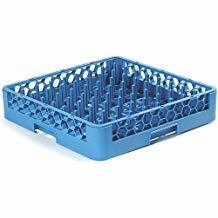 This product has 9 x 9 rows of pegs spaced 1 7/8" apart to fit a wide variety of plates. This dishwashing rack has an open profile to promote thorough washing and air circulation. This item promotes better washing action, complete rinsing and faster drying, reducing overall water consumption. This dishwashing rack is chemical, impact and heat resistant, safe up to 180 degrees F for 30 minutes. This dishwashing rack has built in base rack dividers making 25 compartments to hold glassware while washing. This item has an open profile to allow for a thorough washing and air circulation. This dishwashing rack promotes better washing action, complete rinsing and faster drying, reducing overall water consumption. This base comes with 3 extenders to accommodate those taller tumblers or champagne glasses. This dishwashing rack extenders have a snap fit and will not loosen over time or come apart. This dishwashing rack is produced from 100% post industrial plastic making it eco friendly. The item will accommodate virtually any glassware or smallware while reducing breakage. This dishwashing rack has built in base rack dividers that provide 100% vertical protection. This holder comes with 1 extender, that has a snap fit that will not loosen over time. This dishwashing rack has 16 compartments to accomodate your glassware items. This Vollrath flatware rack holds up to eight flatware cylinders (not included). This receptacle is 19 length x 10 width. 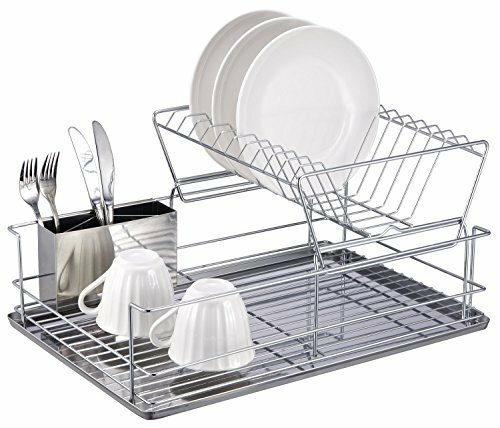 This flatware rack has an open design which promotes better washing action, complete rinsing, and faster drying. This basket nests within its family for compact storage. This flatware rack offers outstanding strength, adaptability, versatility and durability. The kitchen sink caddy uses 304 stainless steel, large space, can hold a lot of things and can afford enough weight, easy to use. The sink caddy is 7.4inch long, 4.5inch width, 5.1inch high which proves perfect space for kitchen helpers like a sponge. Perfect for storage compaction cloth, sponge, soap, dishwashing liquid, easy to find these tools while washing dishes. The bottom have the hollow design for fast draining, which can keep clean and sanitary. Great for home and it's a great kitchen accessory for you to your keep kitchen clean. Hook design, simple installation, it can be used repeatedly. Unique outer rack design, it creates a space for your kitchen towel, very functional. Perfect to hold sponge, soap, brush, towel, more convenient for you during washing dishes. Hook design, simple installation, fast removal and easy to clean, can be moved and used repeatedly, save your space. 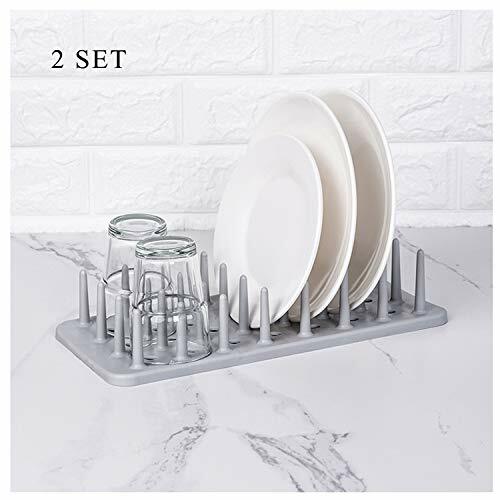 Open and hollow bottom design allows water to drain fast, the sink rack will keep your utensils away from dirty water in the pool and prevent bacterial from growing. Dimension: 14.5"L x 9"W x 0.8"H (37cm x 23cm), more suitable for small sinks. Material: 12 Premium 201 stainless steel rods with eco-friendly green silicone ends. Feature: Non-slip, Heat Resistant and Rust Resistant, BPA Free. Foldable rolls up for easy storage, save place. The multifunctional kitchen gadget tool perfectly for many kitchen task, you will be surprised and love it! 1. Ideal for air-drying any washed dishes such as cookware, fragile glassware, etc. 2. 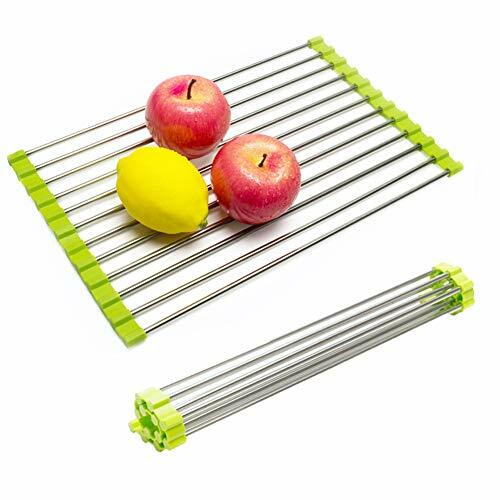 A trivet mat for hot dishes or pans, as well as a drainer when drying veggies and fruit and defrosting food. 3. Simple over-the-sink cooking prep works platform. -Please firstly measure the size of your sink before purchasing. -Please clean, wipe and dry the colander after use. Recommend use sponge to clean every other day. Multipurpose drain rack can be used for drying washed utensil like cups, plates, bowls, and other tableware, cookware, etc. Also can be used as vegetable colander and prep works platform over the sink, even as a cooling board for baked goods and more. The silicone edges of this dish drainer are slip resistant, keeps the rack firmly in place. So you will not have to worry about dishes or food you are rinsing and drying to fall into your kitchen sink. Lightweight and portable, excellent space-saver dish drainer rolls up and goes in a drawer or cabinet quickly when not in use, keeps the kitchen sink area looking neat. Easy to disassemble and random assembly, easy to clean, quickly wiped to dry to keep clean. What's more, besides daily use such as rinsing, thawing frozen items, hanging wash cloths and sponges, this remarkable drying tray also makes an excellent heat resistant tool as a trivet mat for those hot cookingware dishes at Thanksgiving and Christmas! Size:14.5L x 9W (37cm x 23cm), more suitable for small sinks, not need cut to smaller. Please kindly measure your sink size firstly before purchasing our dish drying rack. Carlisle s OptiClean system includes a full range of glass racks designed to meet your needs. Full dividers in the base offer complete protection for delicate rims. Solid dividers in The OptiClean Glass Racks with Color-Coded Extenders make it easy to identify glass rack size or match specific glassware with a specific rack simply by color. The chopstick holder is made of high quality Stainless Steel, corrosion resistance and high temperature resistance, durable, lead-free and non-toxic, bright and easy to clean, has a long service life. The size is about 16x10x17cm.Won't take up kitchen large area, save space. Double-grained placement of more profitable items.Hook up to 1.6 cm diameter round tube. It has a high capacity and adaptability, used to organize your bowl, plates, dishes, spoon, cups, chopsticks, chopping board, knives, etc. The bottom with a removable drip tray collect the rack water, making your kitchen look dryer, cleaner and more organized. The dishwashing rack is made with a black 100% post-industrial plastic that is sure to hold up for years of service. This material is light weight but yet still extremely sturdy. Additionally, this dishwashing rack has an open profile that allows for a thorough washing cycle, plus added air circulation. Each product come with 1 extender that will not loosen or break apart over time. This dishwashing rack also will cut down on overall water consumption.